Eight men have been sentenced to different jail terms over a double heist on the Harry Winston store in Paris that netted watches and jewels worth more than $100 million. The sentences ranged from nine months to the 15-year term given to the man believed to be the mastermind, Douadi Yahiaoui, nicknamed “Doudou”. Four robbers pretended to be builders in the first heist in October 2007. In 2008, four thieves again gained access, with three of them this time wearing women’s clothing and wigs. In March 2011, police found $19 million worth of jewelry from the 2008 heist stuffed in a drain in the Parisian suburb of Seine-Saint-Denis, but much of the loot has never been recovered. Prosecutor Sylvie Kachaner said Douadi Yahiaoui, 50, who has already served 23 years for theft and drug trafficking, was the brains behind the outfit. One of those convicted was Mouloud Djennad, who provided insider information from his job as a security guard at the store. For the 2007 heist, Mouloud Djennad let in the robbers the evening before. They threatened employees and took items worth about $35 million. The heist in December 2008 netted about $79 million. 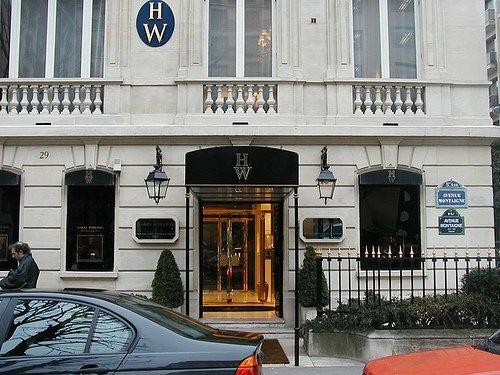 The Harry Winston boutique is situated on the fashionable Avenue Montaigne in Paris and attracts a wealthy clientele from around the world, from royalty to movie stars.